“The idea is to remain in a state of constant departure while always arriving. It saves on introductions and goodbyes.” There are certainly no introductions by noise master Sec_ in this album. 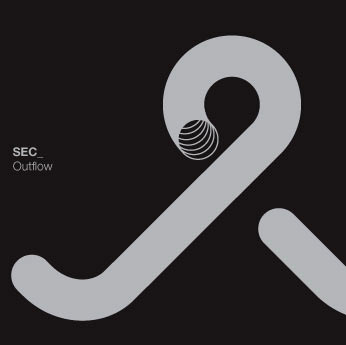 ‘Outflow’ sends its disrupters with maximum power from the very beginning of the first track, but it does so in a cunning way that makes the punishment of hostile music an educating reward. There are no walls of noise in here, only hundreds of needles that stimulate the nervous system completely, turning the listeners into ecstatic vessels who can only try and contain the stimulating bombardment of sound. Sec_ never hits in the same place twice, thus keeping the listeners both on their feet and surprised at the same time for 42 minutes. As it bends in from being the bombastic trumpeting of doom into a drastic glitch in the matrix, one can only stand in awe at how ‘Outflow’ breaks the familiar linear boundaries and surprises us with an intimate look at how it creates life through sonic violence. The tools for this adventure are Revox Tape recorder, No-input feedback, Radio, Field recordings, Synth, Microphones and pick-ups, Neon and CRT TV. It might be easy for some readers to imagine the general lines of music from this arsenal of sound sources, but you can think you’re as ready as possible, and nothing can prepare you for such a majestic earthquake. No goodbyes either. The album ended. Press play again.